A handmade rug that is affordable. Colors of this rug are not very vivid, but it helps to match any room and furniture. Overall I am happy with it. The only thing that can be a negative is that it sheds in the beginning and when vacuuming. I had the same problem with other handmade rugs, so I guess it is normal. Bring luxury to your home with this traditional area rug. Hand-Tufted with 100-percent wool, this floral designed rug will add a pop of color and the finishing touch to your decor. 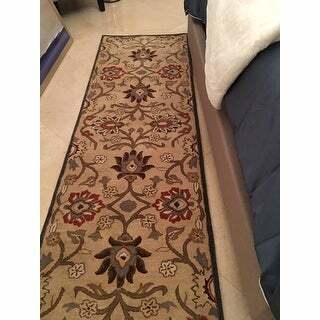 Having recently been very satisfied with our purchase of the Hand-Tufted Yate Wool Rug, we were anxious to find the same in a hallway runner rug. Unfortunately, the same Yate Wool Rug was not available in a hallway runner. We therefore opted for the Hand-Tufted Patchway Wool Area Rug in the Rust color to again complement our gunstock oak hardwood flooring. We were again extremely pleased with this purchase. The Rust color we chose is somewhat more of a rust-red in color and the plushness and quality of the wool carpet, as well as the attractive sale price, added to our pleasure and satisfaction with our purchase. We were also surprisingly pleased with the short turnaround time from placing our order until receipt of our carpet. With this and other recent and past purchases, we continue to be very satisfied with Overstock offerings we've found. 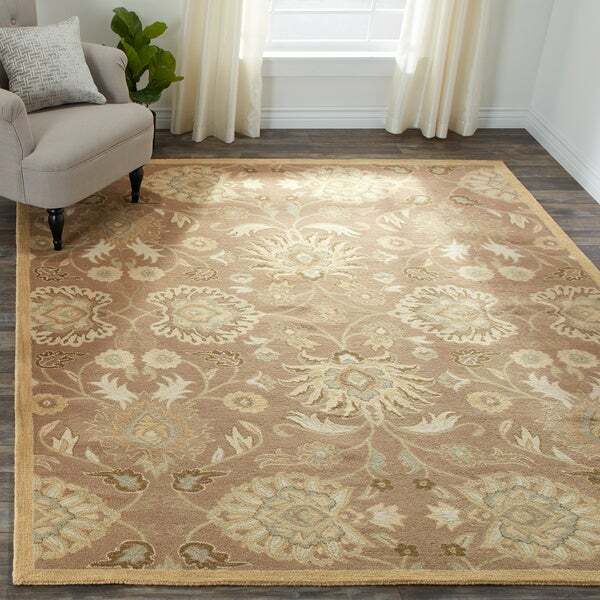 This lovely wool 9X12 area rug appears to be a high quality and is even nicer than I expected. Lush pile with colors true to what appeared on the website. It looks perfect in the living room and blends nicely with the antique surroundings. It arrived quickly and was well packaged to avoid any moisture or other damage. I ordered the 4' x4' in rust. Beautiful, exactly as described. Thick and soft, sheds somewhat, but it is a hand tufted wool rug, this is expected. Would not hesitate to order if your looking for a rust colored rug! LOVE LOVE THIS VIBRANT ECLECTIC RUG. This rug is awesome. The colors are vibrant and the blues are blue. Thigh and lush. Highly recommend. Sheds at first but that is a common problem with wool hand tufted rugs. This rug would go with almost any decor. 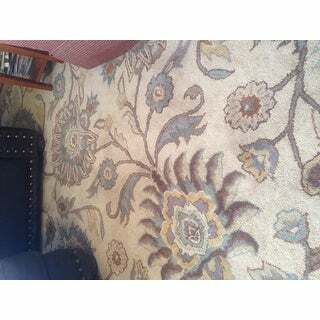 I am so pleased with this hand tufted rug; it fits perfectly in my house. It's quality is wonderful and it feels very soft. 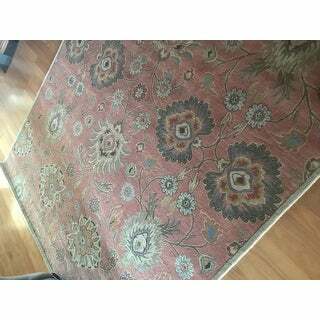 Patchway wool runner in beige. We are very pleased with this wool runner that matches our large area rug that's in the same pattern. The rug arrived well packaged. I was pleased with the thickness and quality. The sizing was accurate. I ordered the Slate (blue) rug and the colors were exactly as they appeared online. As with all wool rugs, it is shedding slightly, but this condition resolves with time, wear, and vacuuming. I would recommend this rug. The rug I received had a Surya Rug tag on the back. Thumbs up for that. I have read various reviews about this style/color of rug and one review holds true. The colors are definitely muted. Do not expect detailed/brighter colors. The trim on the beige rug is a golden tan color. As far as shedding, YES! And yes, it is a wool rug. The color in between the design is vaguely "patchy". As one reviewer said "It looks dirty". I gave it 4 stars because overall I am pleased with the rug. I was looking for a more muted color, wool with a nice thick pile. I have the rug in a place with low lighting so the "dirty" part is not really noticeable. We purchased this rug in the beige color. It is beautiful. It was shipped timely, and in exceptional condition. We did purchase the 2'x3' size prior to ordering, however, just to be certain of the color and how it would work in our rooms. Once we decided on the color, we purchased both the 8'x11' and the 10'x14'... The colors are as pictured, it is thick and luxurious. Definitely sheds, but this is expected with a new wool rug. Very pleased with our purchase. This is a very high quality, elegant rug. The colors are more muted than expected and the base color is more tan not cream. One sample picture shows it in front of a couch and the colors are more bright, that is NOT how it looks. Don't buy it off that picture as you'll probably be disappointed. It does shed a little bit, but it's nothing major unless you plan on rolling on it often. The colors are tan, rust, gold, steely blue, and hints of light gray. I'm very pleased with it. It's very sturdy and gorgeous. It's holding up to a toddler just fine. Just wipe up any spills and they're gone. Nice pattern, doesn't look cut off or anything. Price is excellent. Couldn't find this quality of a rug for that cheap any where else! 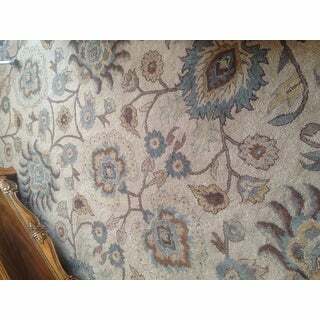 Extremely well made are rug, lovely pattern, quite thick and very comfortable underfoot. I took a star off because the color I chose, cream, was really a beige and quite dull. While it is quite nice, I needed something to lift the colors in the room. Just be aware the color shown in photo is not accurate. I have ordered the light orange instead and will review that when I get it. Beautiful! Matches my colors well and was true to online color. Nicely backed, soft underfoot, heavy enough to stay put without a pad - quality rug for a great price. Right weave, thick rug. Measurement not exact. Listed as 10' x 14'; measured at 9' 8" wide; 13'9". This rug is great! I had been eyeing it for a while but was nervous of ordering it without seeing the actual colors. I then found it at a furniture store in Chicago and it is exactly what I wanted, only the store was charging twice what overstock was! 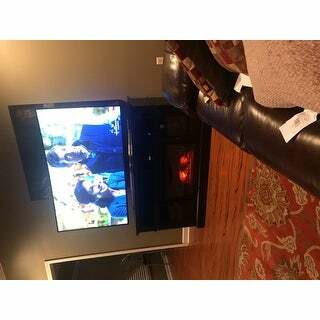 I ordered the rug and LOVE IT!!!! I ordered 2 runners 3 by 12. The quality is excellent. The carpets are very thick and I don't need a pad even on tile flooring. My disappointed was the color. I ordered beige. The background color is a dingy grey which almost makes the rug look soiled. I did keep the rugs because everything else about them was so great. Nice look, matched a larger rug I had ordered. Sheds for a while . I buy all my rugs from Overstock. As usual, I love this high quality wool rug. I've received many compliments. We replaced the old runners around our kitchen island with these. The burgundy/mixed pattern blended well with the dark wood and black appliances and added warmth to the tile. Perfect fit! Quality is excellent - very thick pile. This is a nice quality rug though it does shed a bit. I like the coral pink/ cream color combination and put it in front of my bedroom dresser. Nice rug but I ordered orange but when it arrived it was more of a pink color. I bought 4 different sizes in the orange color and they are beautiful! The color is more of a salmon or light rust. I would not call it orange, but I felt confident between the pictures and reviews that the color was what I was looking for. I have had the rugs for almost 2 years now, and they still look amazing. They do shed quite a bit. In the beginning the 8x10 rug would fill up my vacuum canister. It still gets little fuzz balls of fibers on it, but it is not in a high traffic place so it doesn't get vacuumed as much as the other rugs by doorways. Sizes are pretty accurate, pile is luxurious to walk on. I'm about to buy another 4x6 for my kitchen, glad to find same rug still available. As advertised. Like the pattern. Has worn well. This is a beautiful rug, in fact we ended up purchasing a second matching one. The only complaint that I have is it "shed" a lot of fibers for probably a good year. We were constantly having to sweep the hardwood from all of the balls of fibers that gathered. But after about a year, it doesn't shed nearly as much. "What are the accent colors in the burgundy rug?" The colors are: Burgundy, Taupe, Tan, Dark Brown, Khaki, Camel, Burnt Orange, Medium Gray. "I want to buy the cream one like the one in the picture size 8x8 and size 5x5 are they available?" My apologies for any inconvenience, we unfortunately do not carry this in a 5x5 size. "Between the beige and the ivory which one has a "teal" blue in it?" Neither one have teal but the 17701871-000-008 has dark green and sea foam green in it. I hope it helps. "What are the Pantone colors in the blue-slate-beige rug?" "Better question...what rug is picture number 6?" It is the black/beige option. "What picture is beige, brown, beige?" 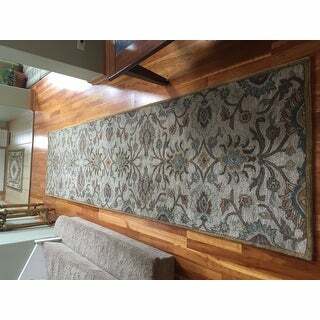 The beige brown rug is pictured in the first and second image.